This MP3 file is from the album Down Longford way / music by Katharine Parker. Duration: 1 mins, 45 sec. Recorded/performed at: Studio 200, ABC Sydney, on 7 Jul 04. 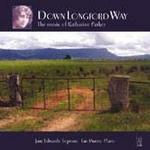 CD: Down Longford way / music by Katharine Parker.